Kenyan Counselor Hopes To Boost Income By Growing Kale And Tomatoes : Goats and Soda Could tomatoes and kale bring in the green? Or will bacterial wilt get in the way? Whatever Happened To ... The High Hopes Of A Rookie Farmer? Faith with her beloved tomato seedlings. Faith wanted to boost her $200 monthly income as a counselor for people with HIV. So she turned to farming. How did the crop turn out? On a warm sunny August day at Kwale town on the Kenyan Coast, Faith tends to her small urban farm. She is uprooting some of her kale — victims of damping-off disease, a fungal disease that rots the stems. This horticultural disease has turned what she thought would be a worry-free farming venture into a challenging experience. When my sister Faith ventured into farming earlier this year, she expected everything to go smoothly. After all, she was working hand-in-hand with a competent and experienced agricultural extension officer who was available 24/7 to help make her venture profitable. Three months later, after her first full season, we caught up with her to hear how her first crop fared. 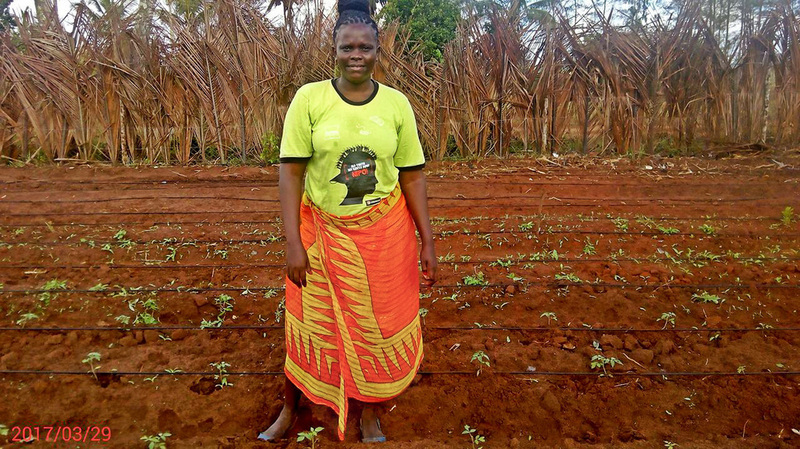 "I planted four vegetable crops which are very popular in Kenya — kale, spinach, sweet peppers and tomatoes. All was well from the time of seed germination to transplanting. After two weeks of transplanting, my urban small farm looked very beautiful — ooh, the green was beautiful! My neighbors could not stop admiring my farm. There is an inner satisfaction to a farmer when you see your crops thrive and produce. "The tomatoes did very well. I planted Syngenta's kilele F1 tomato — one of the drought-tolerant, high-producing varieties. This variety lived up to the hype and gave me joy from the time I planted it to the time I sold the fruits. From 100 plants I harvested about 5,000 tomatoes. And I was shocked by the demand for the vegetables. Customers kept on flocking to my compound to buy the vegetables, which I sold for 5 shillings a tomato [for a total of $300]. I used the money to pay back the small loan I had acquired at the start of my farming venture. "Earlier during the growing season, my tomato plants suffered from bacterial wilt disease. I still remember how one morning I woke up to a scene from hell — leaves wilting at the top of about 20 plants. It was early in the morning, and the sun was not yet out, so there was no way they lacked water. They looked as if they were dying. I reached out to my extension officer, who upon visiting my farm told me that the plants were sick. He uprooted them to avert further spreading of the disease. But I was able to transplant new seedlings to take their place. "With the kale and spinach, if it had gone as it should I would have made very good money. But the story is sad. While a few of the plants blossomed early on during the season, many were affected by damping-off disease. In fact, my neighbors thought someone had bewitched my small farm. My extension officer kept on encouraging me to replant and use pesticides to fight the disease, which is caused by fungi. Honestly it is the most difficult thing to do as a farmer: to plant crops and then see them die. "But I am not alone. Farmers around me complained of the same disease. After a few brainstorming sessions with other farmers, we concluded that the variety we planted could be susceptible to the disease. Next season, I plan to plant a new variety." Faith says she had fun with her farm despite the tragedies and looks forward to the next season. She has tomato and sweet pepper seedlings ready to transplant this fall. Incorporating lessons from the last season, she will plant new kale and spinach varieties. And she's become a role model to other young women in her town and gained a new nickname: "mama mboga" — "mama vegetables."